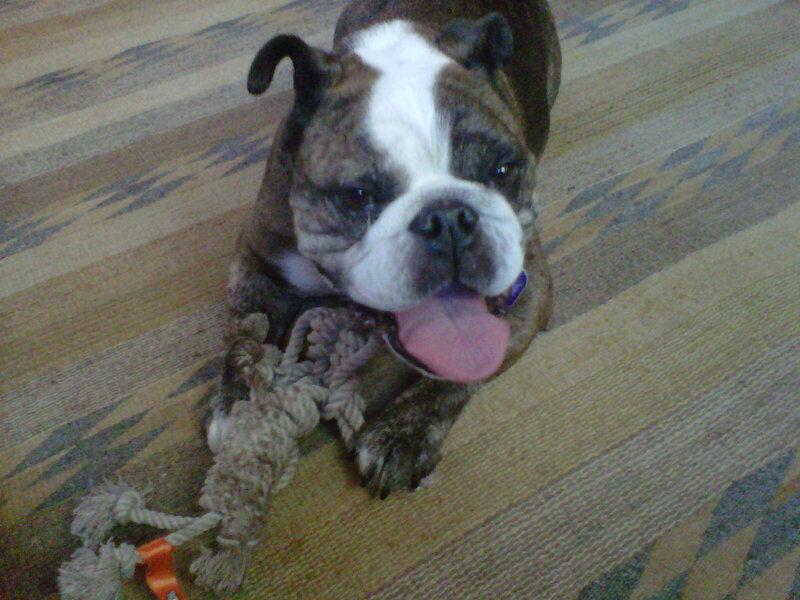 Lola, an 8-year old English bulldog, stayed with me for the first time three weeks ago. I’ve known her since she was a puppy. Every time I’d visit my daughter in LA, while I was living in Hawaii, Lola and I played together… for hours. A couple of months ago she suffered a heart attack which really slowed her down. She was put on three different medications. Now that I live in LA, I visit my daughter every week, with few exceptions, so I saw Lola each time. She was still happy to see me, but generally layed low in her bed. When my daughter announced to me that she was going on vacation, I volunteered to keep Lola at my house. The day she arrived, I was so excited to have her with me. I love her very deeply, as does anyone who knows about animal bonding. She literally was like a grandchild to me. After a couple of days orienting herself to our yard and where she needed to do her business, she completely fell in love with living here. I ran out to the local pet store to get her bones and chewey toys (pictured). In the morning when my husband and I were having tea, Lola would make herself at home between our feet, resting on an antique Navajo rug. She’d work her way under my seat, where she lay her face on a pillow beneath my chair and gnaw on her bone. Every once in a while I’d feel her head bump my bottom and that would make me giggle. Her bed was under my Grand Piano, covered in an antique Barcelona shawl. She’d enter her boudoir through the fringe and peacefully sleep through the night. The day Lola went home, she was so happy to see her “Daddy”, but what I didn’t know was that was the last time I’d ever see her. Lola died last Tuesday, October 1st. I miss her terribly. She left an incredible imprint on my life. It’s as though she’s still with me. I’m sure you know what I mean if you’ve ever loved an animal as much as I loved Lola. Even after they have departed, they’re always with you, deep in your heart. Before I had grandchildren, Lola was my Granddogger! I am sorry for everyone’s loss in your family Donna ! of these children, at some time in their lives, get another pet. large black and white male cats, Oreo and Tux. It’s ok guys we’re liberated now, no one is gonna stop us now ! Backseat – Carina Round – Friends are all you need to know ! We could make it look real couldn’t we ?